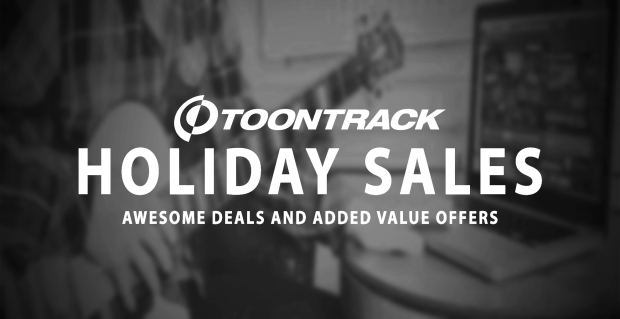 Toontrack have some great deals running form now until December 31st. Here is your chance to make substantial savings on some of their best selling products, or get great FREE expansion packs when you purchase EZDRUMMER 2, EZKEYS or EZMIX 2. Get selected Toontrack EZX EXPANSIONS for only $49! Get selected Toontrack SDX TITLES for only $89! Get Toontrack EZDRUMMER 2 and GET ONE EZX PACK FOR FREE! Get Toontrack EZKEYS and GET ONE EZKEYS SOUND EXPANSION FOR FREE! Get Toontrack EZMIX 2 and GET ONE EZMIX PACK FOR FREE! Get selected Toontrack EZDRUMMER BUNDLES for only $199! Get selected Toontrack EZMIX 6 PACK BUNDLES for only $99! Get Toontrack EZkeys Essential Pianos for only $99! The world’s most intuitive drum production tool for songwriters. The ever-growing selection of sound library expansions for EZdrummer and EZdrummer 2 offer meticulously recorded, mix-ready drums for a wide range of styles. All engineered by top names and recorded in some of the world’s finest acoustic environments. EZkeys is more than a piano or keyboard instrument – it’s a powerful songwriting tool. It comes packed with intuitive functionality that will make it a breeze adding creative layers of music to your songs or writing custom pieces from scratch. This entry was posted in DontCrack, Event, Misc, Plug-ins, Promotions, Virtual Instruments and tagged EZdrummer 2, EZDRUMMER BUNDLES, EZKeys, EzMix 2, EZMIX 6 PACK BUNDLES, EZX expansions, Toontrack, Toontrack 'Bundle Deals', Toontrack 'Holiday Deals', Toontrack SDX TITLES. Bookmark the permalink.